I started my first blog six years ago for fun, not for business. My first blog was called The Button Owl and was built on Tumblr. It was about lots of stuff- fashion, personal style, craft, lifestyle... I had this blog for about a year and totally loved it. I then switched to Blogger and created a fashion blog called Flower Child. I made friends in the blogging world, I realized I wanted to blog about personal style instead of all the other stuff, and I really found my voice. 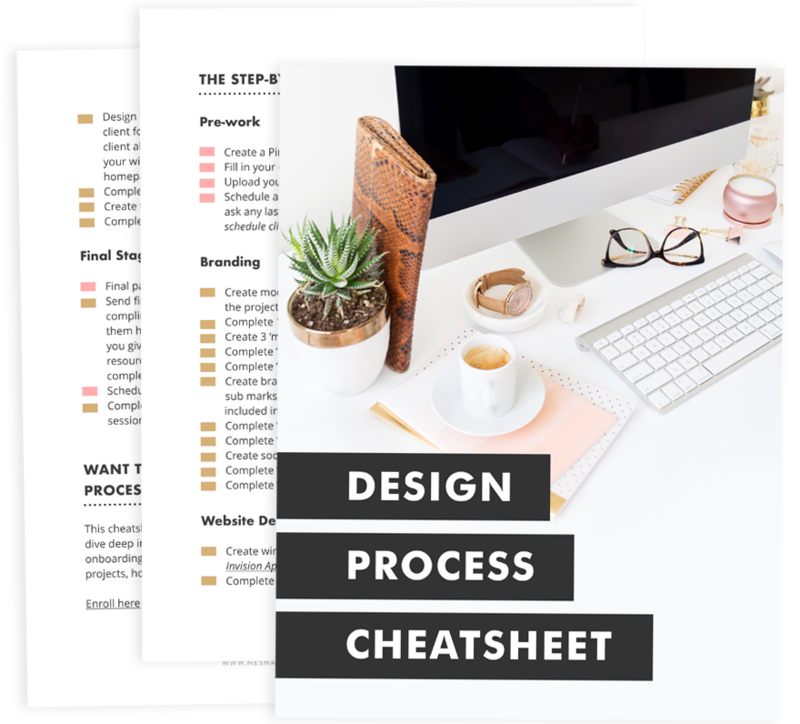 But the most important factor here was that creating my blog was my first real stepping-stone towards building my own design business and booking paid clients, something I didn't know I wanted to do at the time. I loved experimenting with my blog design and creating new logos. When my blog started to grow, I started receiving design requests. I couldn't believe that just by doing something fun- blogging- I was able to attract paying clients. It was easier than I thought, and with a little social media marketing I soon discovered that I could earn more than I did at my day job. That's when the cogs in my brain started turning and I decided to quit my job and give freelancing a shot. Do you need lots of blog readers to start turning some of them into clients? No. Remember the old saying, quality over quantity? I firmly believe that a quality blog audience is more valuable than having an audience of lots of readers who barely interact with you. If you don't have time to blog every day or three times a week, then don't. Blogging so much isn't the only way to achieve success with your blog. Try blogging once a week. One in-depth, quality blog post is all you need to kick off your blogging. Look at it this way: you could receive 1000 visits to one blog post by promoting it thoroughly, or you could post 5 times a week and get 200 visits to each post. That's the same number of visits each week. The first option doesn't require much time writing, just a bit more marketing. The second option requires LOTS of time writing, and then time marketing each blog post. Why add so much work to your load? I know which option I prefer. Write quality content. Clients will be impressed by articles that are deep and show your expertise. Create pinnable blog post graphics. Graphics that get the most pins on Pinterest are vertical and the text on them is big. These images will catch peoples attention on Pinterest- hopefully your potential clients. One of my recent inquiries came from a woman who found me through Pinterest so never underestimate it! Pin one of your articles every day. Pinterest is my highest source of blog traffic and lots of my clients find me through it, so it's important to pin every day. Share your blog posts on social media every day. There are hundreds of potential clients on Twitter, Instagram and Facebook. Make sure you're sharing your work and blog posts with them every day. The more you share on social media, the more potential clients will come your way. Share your work on your blog. If you design websites then share your work on your blog. Sometimes, people read your blog but have no idea what you do. If you share your work with them on your blog it could spur them to inquire about your services. Even if your clients haven't found you through your blog, your blog will help them decide whether they want to hire you. One designer, Sarah, is a hard worker and extremely talented. She doesn't have a blog but she has a portfolio website that showcases her work and her contact details. Another designer, Amy, is also very talented. She has a portfolio site that showcases her work and her details, but she also has a blog filled with behind-the-scenes info on her processes, articles that show off her expertise, and a tribe of people who comment and show their love for her. Which designer seems more appealing to a client? And which designer would you pay more? It would usually be the second designer because she gained your trust by showcasing her expertise on her blog. I've noticed that a lot of my clients subscribe to my email list before getting in touch, and they sometimes comment on blog posts. One of my clients told me last year that my blog helped her decide to hire me because my articles proved that I knew what I was doing. All of this shows that if you don't have a blog, you should really start one. The bigger you build your blog tribe, the more people you can sell to. You can sell eBooks, courses, digital goods, consult calls.... anything! There's a community of loyal readers just waiting for your help. And if you're smart and you love them enough, you'll provide it. Post quality content regularly, even if it's just once a week. Share your content on social media every day. Showcase your expertise on your blog. If you put your heart into blogging and you provide your readers with content they actually need (instead of just posting about your cat or your vacation) then I promise you'll attract clients and start making money from it. So, now that you've learned some new tips and tricks that will help you find clients from social media, referrals and your blog, how will you book those clients? Often, finding clients can be the easy part. Booking them can be tricky, especially if you don't have a system in place. Creating canned emails so you don't have to keep retyping what you tell every new client. Creating reusable questionnaires for each of your services. Implement apps that save you time in the booking process. I'm going to go through my own booking process with you so that you can hopefully take some ideas from it. You may have seen in last month's article, How I manage my client flow in Streak, a little snippet of my inquiry process. But I'm going to break it down here and explain exactly how I streamline my bookings and inquiries. 1. I receive an inquiry. All inquiries come through the simple contact form I have on my website. It asks for a few details (name, email, URL, which service they're interested in) so that I know a bit about them before I even reply. You'll notice that I point inquirers to my FAQ page- it helps stop them from asking me questions that are already answered there. 2. I send them a canned email response. Since most inquiries are the same, I send a canned email response (an email template) in Gmail. It tells them when I'm available, how long their project would approximately take, and asks them to schedule a Skype consultation with me so we can discuss their project more. 4. Calendly notifies me and the client when the consultation is due. But I find it nice and helpful to drop them a message the day of the session as a bonus reminder. It's just a short canned email, but they don't know that it's canned. It shows that I care and I'm looking forward to 'meeting' them! 5. We have our Skype consultation. In their Skype discussions we usually talk about their business, goals, needs, and target customers. Then we ask each other questions. You can read up on my tips for Skyping with clients on my blog! 6. I send another canned email. I call this one my 'after skype' email. I give them a short summary of our conversation, I send them my contract, I send them an invoice, tell them how to pay the deposit to book their spot in my schedule, and I attach a recording of our Skype consultation. I then leave it up to them to decide if they're going to work with me! Using Streak, an add-on for Gmail, I set a reminder that will tell me to follow up with the client in 10 days if I haven't heard back from them. If 10 days goes by, I send a canned response that asks if they have any questions or concerns I could help them with. 7. The clients books me. When the client has paid the deposit and signed the contract, I set up a project page in Basecamp for them. You can create project templates in Basecamp so I just duplicate a template. Then I send- you guessed it- yet another canned email. This one invites the client to their project page and explains how we'll use it. It also tells them about the homework they need to complete before their project starts. 8. I send another email. Canned, you say? Why yes. Yes it is. 2 weeks before their project, I email them reminding them to complete their 'homework' and asking them to book a Skype session with me. This year I added 30 minute Skype sessions to my packages so I could discuss the client's homework with them and the client could ask any last-minute questions they have. I find these Skype sessions really good motivators for my clients to get their homework done on time. 9. I schedule an email reminder. I schedule an email to send 1 day before the session, reminding the client of it. 10. We have the consultation! After the consultation, we're both on the same page and excited to crack on with their branding project. You can view examples of my work here and read testimonials from clients who have been through this process over here. There are always more ways to automate and streamline your process. For example, I feel that I could try to set up Calendly to remind clients of their Skype sessions instead of doing it myself. And if I had a virtual assistant, she could handle the emails completely. The more and more you think of ways to simplify your process, the more ideas come to you. I'd love to hear your thoughts on my booking process. Tips and constructive feedback are always welcome! Head to the Facebook group to start a conversation or leave a comment here.